Stepping back in time at the incredible Inca sites throughout the Sacred Valley such as Puka Pukara, Sacsayhuaman, Pisac and Tambomachay. Admiring finely made handicrafts including the traditional Andean fabrics on display in the local markets of Pisac. Glimpsing the everyday lives of the Viacha community, sharing an authentic Pachamanca meal cooked beneath hot stones. Observing the local way of life in the Lares Valley by visiting the weaving village of Choquecancha. Chatting to fellow travelers and locals alike in Huacahuasi, a secluded village accessed with a hike past majestic mountains and glassy lakes. Sensing the magical aura of Ollantaytambo, discovering the intricacies of its expertly-planned architectural features. Setting foot in the magical Incan citadel, Machu Picchu; a once-in-a-lifetime experience. Experience captivating culture in the Andean Valleys of Peru! Acquire knowledge of the Ancient Inca Civilization and their massive structures while exploring and learning of the ways of today’s Andean people. The only way to truly experience a country’s traditional culture is to submerse oneself in the people’s way of life, while learning and understanding the rich history of the region. With Yampu, witness the transcendent landscape and envisage its ancient past. After the flights to Lima, and then to Cusco, take the afternoon at leisure to acclimate to the areas high altitude. 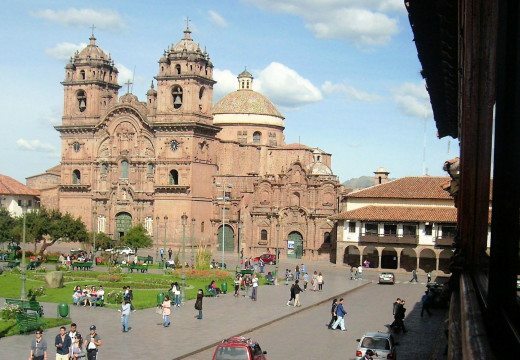 The next day, enjoy several day tours of Cusco! Visit San Blas quarter and see the unmistakable rigor of the Inca walls, walk charming small cobblestone streets with craftspeople who sell their works on the street, and witness the massive Sacsayhuaman fortress along with so much more. Shop the famous market at Pisaq. A morning visit to check out its unique array of products will provide a nice overview of the rich culture yet to be explored on this journey. Travelers seeking inspiration in nature can opt for an invigorating morning hike surrounded by amazing views of the Andes Mountains before enjoying exclusive access to the isolated community of Viacha with a traditional “Pachamanca” meal, cooked under hot stones. Visit the archaeological complex at Pisaq, an afternoon excursion that offers a unique opportunity to explore the complex free of crowds, with the sun setting behind the peaks. Go even deeper with an exploration into the heart of the Lares Valley. A scenic drive into the mountains, along the celebrated “Inca Weaver’s Trail”, allows a visit the unique and uncrowded archaeological site of Ancasmarca along the hub-town of Lares. Visit a traditional and ancient weavers’ village or hike amidst turquoise blue lakes and towering peaks to the remote village of Huacahuasi. Spend time learning more about the heritage and day-to-day activities of the Huacahuasi community. Then embark on a spectacular hike through varied terrain to Ollantaytambo, the oldest living city in Latin America. Enjoy a short, early morning hike to Inca storage structures high above Ollantaytambo for a magnificent view of the town. Later on, embark on a scenic train ride along the famous Urubamba River to Aguas Calientes, before beginning this journey to Machu Picchu. Prepare to be awed by the imposing and skillful architecture of the Watchtower, the Temple of the Sun, and the royal Inca residences, among many others. Take a moment to quietly sit and listen to the wind or to meditate and absorb the mystical energy that envelops. Contemplate the history of Machu Picchu and its mysterious origins. A stop or a stay in Lima can be easily added to the tour for a more detailed experience of Peru. International flight into Lima, Peru. Upon arrival, be met by a Yampu representative to assist with making the connecting flight. Reception at airport and transfer to the hotel. This afternoon is at leisure to acclimate. The elevation in Cusco is approximately 3400 meters (11200 feet), so it is highly recommended to rest upon arrival for a few hours, and avoid alcohol, caffeine or heavy meals. Please consult with a physician for additional details. If one is feeling up to it later, Cusco is a great walking city with sidewalk cafes, street art and local shops to explore! Yampu highly recommends the chocolate factory and shop. Note: Check in to the hotel is at 3 pm. Early check in may be available directly at the hotel subject to availability. One may store luggage at the hotel until check in. San Blas quarter was originally used as dwellings for the Inca nobles, which built impressive stone constructions at a short distance of what used to be Huacaypata and it is the current place of the Main Square. Today the quarter is a conglomerate of charming small cobblestone streets that are very popular among craftspeople, who sell their works on the street. Among its top attractions is the San Blas Church, a temple that houses a pulpit that is a priceless work of art, a wood carving performed by a masterly indigenous woodcarver. The second tour will begin at Sacsayhuaman fortress, one of the emblematic Inca constructions, built by Inca Pachacutec in the 15th century. This huge fortress is made of very large stones, and the manner in which they were transported and cut is still a mystery. The Inti Raymi Festival, which worships the Sun, is reenacted here on June 24 of each year during the winter solstice. Head on to Qenqo, located four kilometers away from Cusco city, which is a mainly religious archaeological complex where it is believed that propitiatory agricultural rituals were carried out. Continue to Puka Pukara, located seven kilometers away from Cusco. Puka Pukara, which means "red fortress", was an architectural complex presumably used for military purposes; it has many rooms, squares, bathrooms, aqueducts, walls and towers, and it is believed that the Inca's entourage used it while he rested at Tambomachay. Next, explore the fountains of Tambomachay, a construction that has fine stone finishing and high command of hydraulic engineering, with aqueducts that continue supplying clear water. Also known as the "Inca Bath", Tambomachay was probably the leisure place for the Inca and his entourage. Note: For more adventurous travelers, Yampu suggests an optional sunset horseback riding tour near the Sacsahuaman Ruins. Please ask a Yampu Travel Consultant for more information. Now that there has been a glimpse of the rich Andean tapestry, today Yampu travelers will have the opportunity to go even deeper with an exploration into the heart of the Lares Valley. A scenic drive into the mountains, along the celebrated "Inca Weaver's Trail", allows a visit to the unique and uncrowded archaeological site of Ancasmarca along the hub-town of Lares. After lunch, choose between visiting the traditional and ancient weavers' village of Choquecancha, or opt for hiking amidst turquoise blue lakes and towering peaks to the remote village of Huacahuasi, where travelers will meet to spend the night. The lodge, which is run in joint venture with the local community and aims to protect the cultural heritage and the environment, provides an interesting insight into the evolving role of the original Andean people in both the culture and commerce of modern-day Cusco. Spend some time in the morning learning more about the heritage and day-to-day activities of the Huacahuasi community. Then, one can choose to embark on a spectacular hike through varied terrain and over a high pass, to the adjacent valley leading to the ancient town of Ollantaytambo, the oldest living city in Latin America. If one prefers to see more of the Sacred Valley, one can drive back for a visit to an ethnographic museum featuring the history of Peru's rich civilization of the past or choose to explore the valley on mountain bike. Afterwards, enjoy lunch in the Urubamba River countryside on the way to Ollantaytambo, where one can spend time meandering through its charming maze-like streets. On this day, enjoy a short, early morning hike to Inca storage structures high above Ollantaytambo which give a magnificent view of the town as well as of the main archaeological site across the valley. Afterwards, as the guide leads through a morning tour of the temple and explains its strategic architectural planning, one will also get a sense of its mystical history-a perfect introduction to the wonder of Machu Picchu. Around noon, embark on a scenic train ride along the famous Urubamba River to Aguas Calientes, the town below Machu Picchu, whose charm lies in a history that began as a small railway stop and evolved into a bustling town still bisected by the train tracks. At dawn, begin the journey to Machu Picchu with a short and rollicking uphill bus ride. As Yampu travelers enter the "Sanctuary" (as locals refer to it), the morning sun rises over the iconic Sun Gate and washes the structures and terraces with resplendent light. Prepare to be awed by the imposing and skillful architecture of the Watchtower, the Temple of the Sun, and the royal Inca residences, among many others. Take a moment to quietly sit and listen to the wind or to meditate and absorb the mystical energy that envelops. One’s imagination will soar while contemplating the history of Machu Picchu and its mysterious origins. Some may even choose a hike to Huayna Picchu, the iconic towering mountain often seen in photographs, for dramatic views that stretch from the Urubamba River valley to the edge of the Amazon Jungle. Either way, travelers will be touched by a feeling of peace and rejuvenation which will linger even during the journey back to the city lights, and hustle and bustle of Cusco. At the appropriate time, be met at the hotel and transferred to the airport for the flights home. Check-out at the hotel is at 10:00 am. Late check-out may be available directly at the hotel subject to availability. One may store luggage at the hotel until the time to leave for the airport. For those who wish to escape from the beaten tourist paths of Peru, Lares Valley is the place to do so. A trekkers paradise, Lares Valley is a prime destination to explore unchanged lands while learning about the local Andean communities and their crafts. Purchase handmade textiles while admiring the astonishing scenery. Built above the small village of Huacahuasi is Huacahuasi Lodge. With each of the 8 rooms having a private bathroom, terrace and a personal hot tub, Huacahuasi Lodge is the place to stay during the ‘Lares Adventure’ trek. Relax and unwind after a long adventure, dine at the lodge’s restaurant. The women who work at the lodge are a part of the local Huacahuasi community, working in traditional dress. local staff provides exceptional service and care to our guests, starting with a welcoming drink and warm towel upon arrival, to hot water bottle and herbal pillow in bed at night. Their warmth and attentive care are what makes our lodges truly feel like your home away from home. The Terra Andina Hotel provides great lodging in Cusco. The dining options feature buffet breakfast served in the open-air dining room, and international dishes in the restaurant. Coffee can be enjoyed in the cafe. Terra Andina Hotel offers business facilities, such as a fax machine, internet connection and a photocopier, and provides dry cleaning, room service and porter service. Spa facilities include a hot tub, a Jacuzzi and hydro massage. The fitness center provides a gym and fitness classes. This contemporary property is 5 minutes’ to Church of the Company, La Merced Church and Central Market. The hotel is contemporary in design, and boasts high ceilings, lots of natural light and makes guests feel welcome and relaxed. Maytaq Wasin has tried very hard to become a discerning traveler’s hotel. It has the right blend of comfort and convenience, is family-run and backed by a helpful team to make the every guests’ stay great. The hotel offers complimentary Wi-Fi throughout the property, Cable TV, complimentary buffet breakfast, and a lovely rooftop terrace. Mutu, at the heart of Maytaq Wasin, serves carefully selected Peruvian and International dishes, as well as an extensive list of drinks. Hotel Rumi Punku is located in the historic center of Cusco, just 5 minutes from the main square and next to the traditional neighborhood of San Blas, on Choquechaca Street. The entrance of the Hotel is an Inca building, being one of the most beautiful and classic entrances of Inca period in Cusco. An unmistakable stamp of the Inca architecture: The trapezoidal inclination, is the reason why the hotel name is “Rumi Punku” which means Stone Door. The rooms are spacious and elegantly designed, and are equipped with free Wi-Fi, LCD Cable TV, minibar, and private bathrooms. Guests can also enjoy the Spa with a Finish sauna and Jacuzzi, and a feast on a buffet breakfast. The beautiful mansion, La Casona de Yucay is strategically located in the Sacred Valley of the Incas in Urubamba, near the Inca town of Ollantaytambo, the markets of Pisac and Chinchero, and the Inca trail leading to the ancient Incan city of Machu Picchu. Yucay was chosen as a place of solace and rest by the Incas, and was originally called Yucaybamba, later changed to Villa de Yucay in the 18th Century. This valley possesses great beauty, apart from being very fertile for agricultural activities. The construction dates back to the year 1810 and has become a place where history, nature and good service blend. La Hacienda Sacred Valley is a family hotel chain with operations in two of the most important tourism destinations of Peru, one being in the Sacred Valley in Cuzco. This charming hotel is located in Yanahuara between Urubamba, the main city of the Sacred Valley, and Ollantaytambo, where the biggest train station to go to Machu Picchu’s ruins is located. The rooms of La Hacienda have wooden flooring and are decorated with warm colors, and include satellite TVs and private bathrooms. Guests can also purchase souvenirs in the gift shop. Located in the city of Cusco, the ancient capital of the Inca Empire, and declared a World Heritage Site, this hotel has 24 comfortable rooms and a historic courtyard with an exclusive spa. Crafted movables. Each room is colorfully furnished and emphasize the distinctive features of Cusco’s region and culture. Tailored decoration, combining modern trends and antique items, ensures guests enjoy a unique experience. Guests can enjoy Esplendor’s heated outdoor whirlpool, buffet breakfast, the complimentary coca station, and the gorgeous colonial courtyard with a dazzling fountain. The name “Pakaritampu” derives from the Quechua words “pakari” which means “dawn” and “tampu” wich means “home”.. Pakaritampu Hotel is located in the Sacred Valley in the village of Ollantaytambo to 2minutes from the train station with direct connection to Machupicchu. The town of Ollantaytambo is the starting point of the Inca Trail, a beautiful place thatoffers various tourist attractions. For travelers wanting to explore the Lost City of the Incas, take a look around colorful markets in Pisac, and be amazed with the Salineras in Maras, Sonesta Posadas del Inca Yucay is the place to do it all. From archeology to shopping and nature adventures, everything can be found here. The 88-room Sonesta Posadas del Inca Yucay is located in the heart of the Sacred Valley of the Incas, five minutes from Urubamba, a one-hour drive from the ancient Inca capital of Cusco and close to Machu Picchu, one of the World’s New Wonders. The Sonesta Posada Yucay is a former 18th century colonial-style monastery and is surrounded by beautiful gardens. A storied mansion dating back nearly five centuries, Palacio del Inka stands in the historic center of Cusco. Just a five-minute walk from the main square and less than a mile from an array of museums, markets, and restaurants. Uniting the past and present, the Spa presents indigenous treatments and an indoor therapy pool. Meanwhile, Inti Raymi Restaurant offers authentic Peruvian dishes. The 203 exquisitely appointed guest rooms combine Peruvian art and handcrafted furnishings with contemporary amenities—from a signature Luxury Collection bed to state-of-the-art technology, including an LED TV, High Speed Internet Access, and an iPod docking station. In the heights of the Peruvian Andes lies the famous Inca city of Cusco. With an excellent location, Casa Cartagena Boutique Hotel & Spa Cusco emerges after years of restoration, preserving the ancient house’s original design, to become one of the most luxurious hotels in town. An intimate retreat consisting of only sixteen ample and homely suites which combine to perfection modern and ancient, luxurious and historical. Enjoy the comforts of this magical refuge, declared a world heritage site, and the unique beauty of its walls which combine Inca stones with colonial architecture. Vibrant is the word which best describes Cusco, capital of the vast Inca Empire some six hundred years ago, now transformed as the most important colonial center in the Andes, an axis of exploration and favorite destination for today’s international traveler. Inkaterra La Casona Cusco, an exquisite 16th century colonial mansion, is an exquisite and exclusive manor, carefully restored to retain its historical heritage. Surrounding the main patio, its eleven suites are provided with chimneys, heated floors and extra-large bathtubs. Its halls are decorated with colonial furniture, Pre-Columbian textiles and original murals. Aranwa Sacred Valley Hotel & Wellness is built on the banks of the Vilcanota River, on the lands of an old colonial hacienda of the 17th century, just half an hour from the city of Cusco, and 30 minutes from the train station in Ollantaytambo, en route to Machu Picchu. The hotel rooms are decorated in Colonial, Modern and Minimalist-styles. Enjoy unforgettable days in the suites of Aranwa Sacred Valley Hotel & Wellness, and get swept away with its mystical atmosphere in the Sacred Valley that combines the magical encounter of two periods: the ancient Inca culture and colonial grandeur in one of the most beautiful sceneries of the world. Set in the Sacred Valley of the Incas in the province of Urubamba, Sol y Luna Lodge & Spa is a complex of stone and adobe buildings and is 3 kilometers from Plaza de Armas, 15 kilometers from the Eye of the Jaguar zipline and 20 kilometers from the Chinchero archaeological site. Elegant, rustic casitas with marble bathrooms feature a rich palette, wood-beamed ceilings, eclectic furnishings, folk art and Peruvian accents. Amenities include free Wi-Fi; some have terraces with Jacuzzi tubs. Complimentary breakfast is served in the contemporary restaurant, which features a seasonal menu; there’s also a bar and wine cellar. The spa features a gym, saunas, massage (fee) and yoga. Set in a tranquil plaza behind Cusco’s main square, this former palace and convent emerged from years of restoration to become one of the city’s most exclusive hotels, Palacio Nazarenas. Step past walls of Inca stones and into a cloistered courtyard with an ancient fountain at its heart. Then be surprised as contemporary Cusco comes to the fore: a fabulous spa, the city’s first outdoor pool and stylish restaurants serving cutting-edge local cuisine. This intimate urban retreat has just 55 suites, each enriched with oxygen and with its own private bar where guests can create drinks accented with fresh ingredients grown at and around the hotel. Located in the city” historical center, the JW Marriott Hotel Cusco combines the needs of today’s luxury traveler with the design elements of an architecturally stunning archaeological site. History-seekers will find Peruvian artifacts in the hotel’s two exhibition halls. Accommodations are equipped with the latest technology including Wi-Fi, LCD cable TVs, and oxygen systems for a fee. Designed around a colonial convent, this hotel features resort-like amenities including a Cusco restaurant with excellent Peruvian cuisine, a bar, and a full-service spa offering a relaxation heated pool, sauna, steam room and treatments inspired by ancient techniques. Tambo Del Inka Resort & Spa Valle Sagrado is set at the base of Ch’iqun Mountain and overlooks the Vilcanota River. This elegant hotel is a 5-minute walk from the lively Plaza de Armas square and 2 kilometers from the Sacred Valley ruins. Posh, vibrant rooms with balconies and marble bathrooms offer Wi-Fi access, flat-screen TVs, iPod docks and minibars. Suites add separate living rooms and butler service. Cribs and 24-hour room service are available. There’s free breakfast and parking. There’s also a luxe spa, an indoor/outdoor pool and a game room with a pool table. Other amenities include a lobby with a stone fireplace and a bar, a business center and a contemporary Andean restaurant. In the Sacred Valley of the Incas, among verdant fields and towering mountains, lies Belmond Hotel Rio Sagrado. Set on the banks of the rushing Urubamba River, this luxury hotel is built in natural materials to resemble an authentic Andean village. Situated at a lower altitude than nearby Cusco, the hotel provides the perfect environment in which to acclimatize, and is an ideal base to explore the Sacred Valley and Machu Picchu. So savor fresh produce in the restaurant, enjoy a local Sacred Valley massage or spend a few soothing minutes feeding the hotel’s baby alpacas. Slip into the spirit of Peruvian life. Our whole trip to Cuzco and Machu Picchu was fantastic. I just wanted to drop you a quick note thanking you again for the excellent package you put together for Nancy and myself last week. Our whole trip to Cuzco and Machu Picchu was fantastic. Our Machu Picchu tour guide deserves special thanks. She was extremely knowledgeable and we had a lot of fun with her. Were it not for her coaching me, step by step, all the way down the death stairs on Huayna Picchu, I might still be up there looking for a place to live. She really went over and above the call of duty and is a fantastic lady. Thanks for putting together such a great trip for us! John and I had a fabulous time on the trip you planned for us in Peru and Ecuador. John and I had a fabulous time on the trip you planned for us in Peru and Ecuador.You planned every part of our trip down to the last detail, and we are happy to report that all went as planned! We were met at every flight by the guides who did an excellent job of teaching us about the areas we were visiting.They made each day interesting and fun. All of our accommodations were excellent, we especially appreciated the splash pool in our cabana at Inkaterra Amazonica. The weather there was very hot and humid, so being able to cool off in our private pool was a luxury! The one day hike into Machu Picchu was perfect. It gave us a taste of what hiking the Inka Trail was like. For us, it was a great alternative to hiking 4 or more days. We were able to see so many other places to add to our experience, without adding too many more days to our trip.